efficient design and the ‘bumper’ style also had the advantage that its oscillating weight could be recessed into the movement rather than sitting above it (as a full rotor is designed to do) which allowed a relatively slim case construction that was usually little different in depth to equivalent manually wound models. This elegant Art Deco wristwatch has a very attractive two-tone dial, the centre of which has a crosshair motif set against a high sheen ground. The movement is Jaeger-LeCoultre’s calibre 404 which the watchmaker first introduced in 1933, the cal.404 was initially developed for use in LeCoultre’s ladies’ Reverso models. 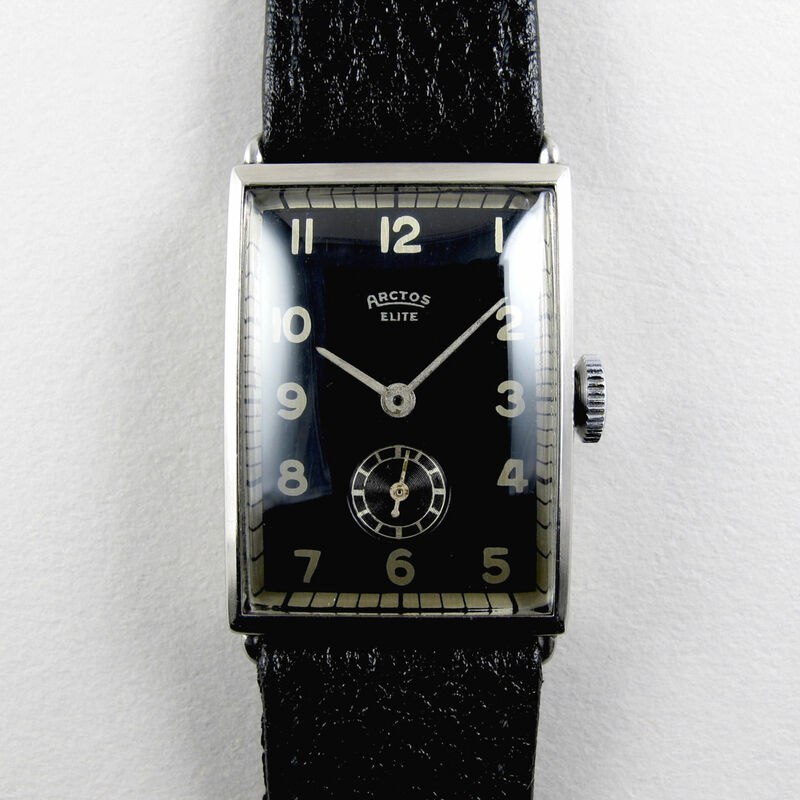 The steel case has the sharp clean lines so favoured by the Art Deco period. Reference 6426 is a handsome manually wound Rolex model with a case diameter of 35mm. 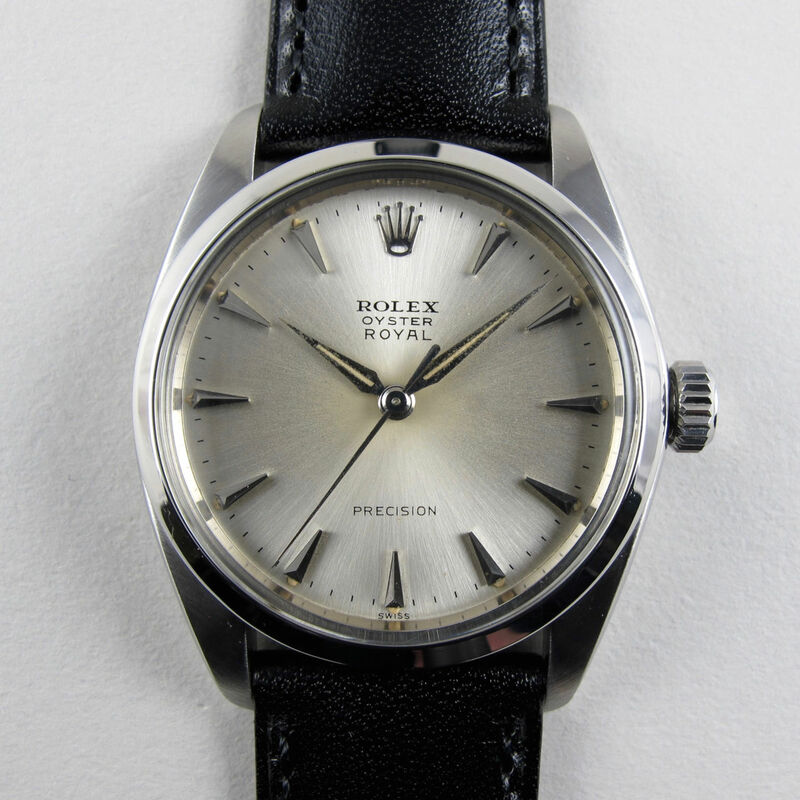 This example has a silvered satin finished dial that is in lovely condition, with multi-faceted triangular numerals which are of equal size around the dial; this design does not allow the quarters at 3, 6 and 9 o’clock to dominate and instead accentuates the Rolex crown emblem at the 12 o’clock position, it being the only hour index of differing design. 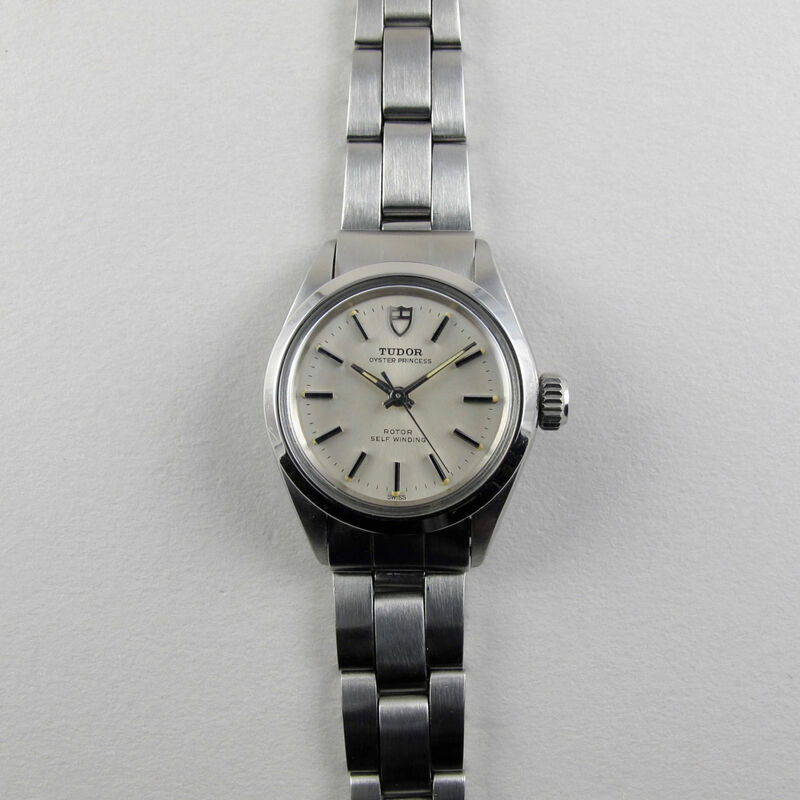 The stainless steel Rolex Oyster case has a smooth polished bezel and the case back is date stamped for the first quarter of 1963. As part of this watch’s service and overhaul it has been pressure tested for water-resistance for depths up to 100 metres. 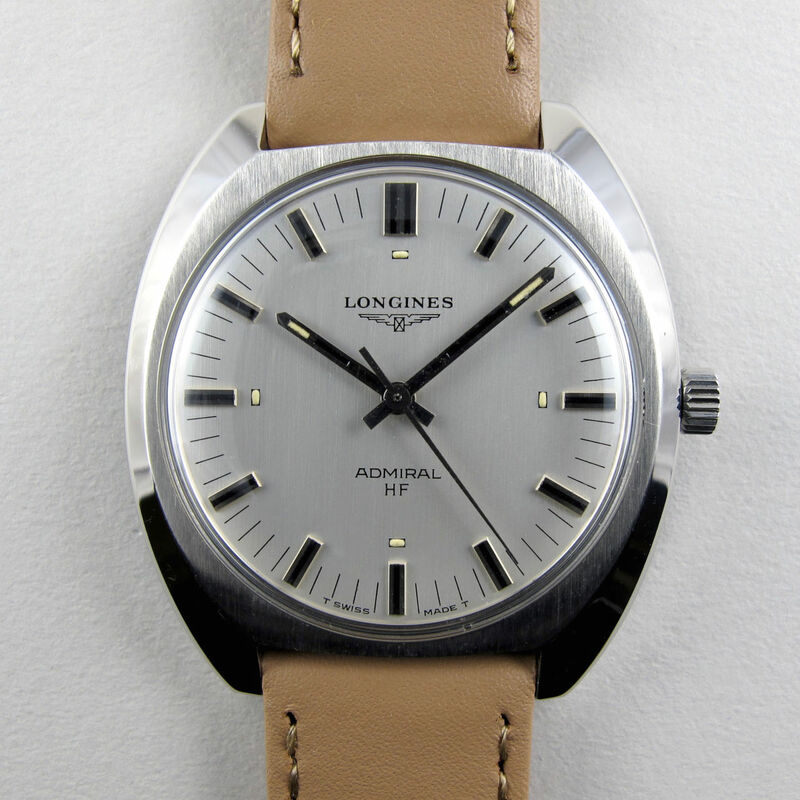 A great looking vintage Longines model, the dial of this watch has a silvered finish with unusual luminous rectangles beneath the quarter hour markers. The clarity of the dial’s design is superb and is complimented by the 36.5mm wide, angular tonneau-form steel watch case with its combination of satin and polished finishes. The watch incorporates Longines’ calibre 6942 which has an unusual hack feature – when the crown is pulled out to the hand-setting position, the seconds hand will stop when it reaches the 12 o’clock position, the user can then push the crown back in upon a time signal or when synchronising to another timepiece and the seconds hand will start immediately. This watch is fitted with its original steel Longines buckle with the watchmaker’s winged hour glass logo. 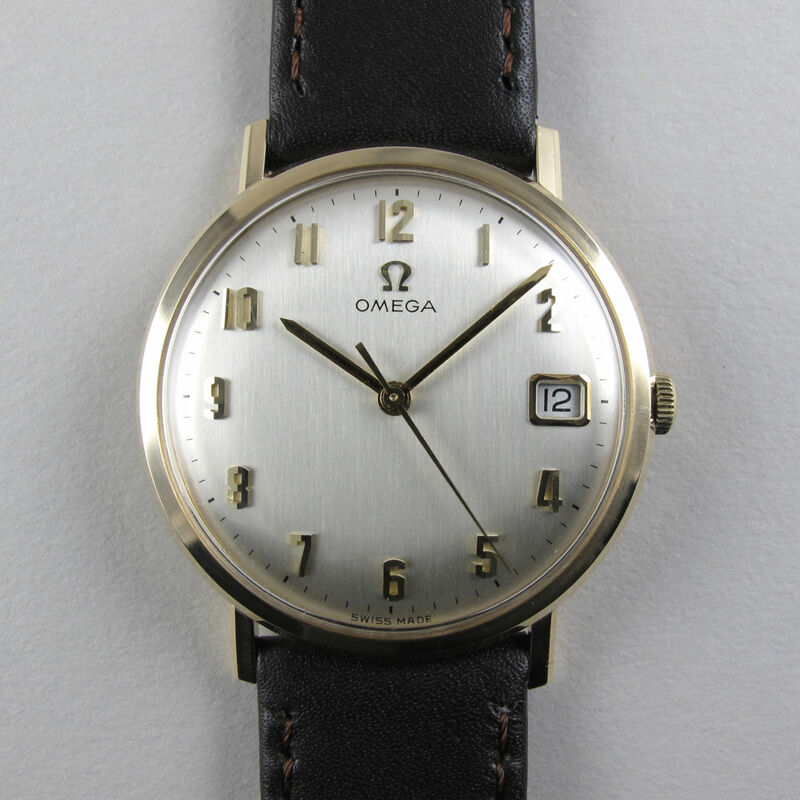 A great looking dress watch, this gold Omega model is in excellent original condition with a lovely lustre to the dial. The case remains in unpolished condition with crisp definition to its angles and edges. Powered by the calibre 611, this watch has provision for semi-quick date change – whilst the date will change each day at midnight, it can be manually advanced when required by moving the hands backwards and forwards between 9pm and 1am. Hallmarked for the years 1967-68, the watch is accompanied by its Omega presentation case and original numbered guarantee booklet and further booklet which are contained within a red Omega plastic folder. 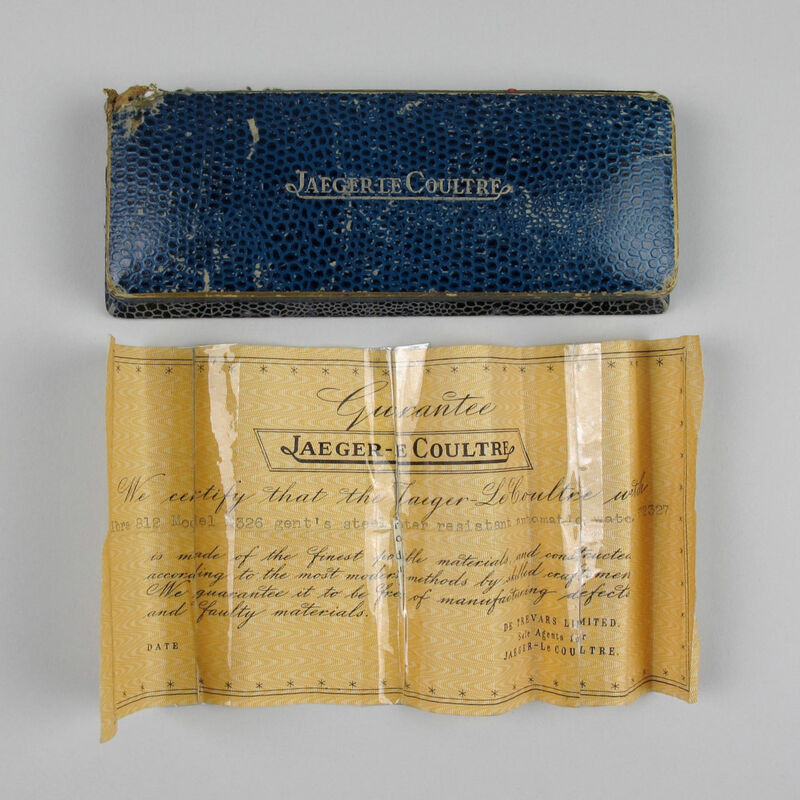 The guarantee notes that the watch was sold at Mappin & Webb in 1970. 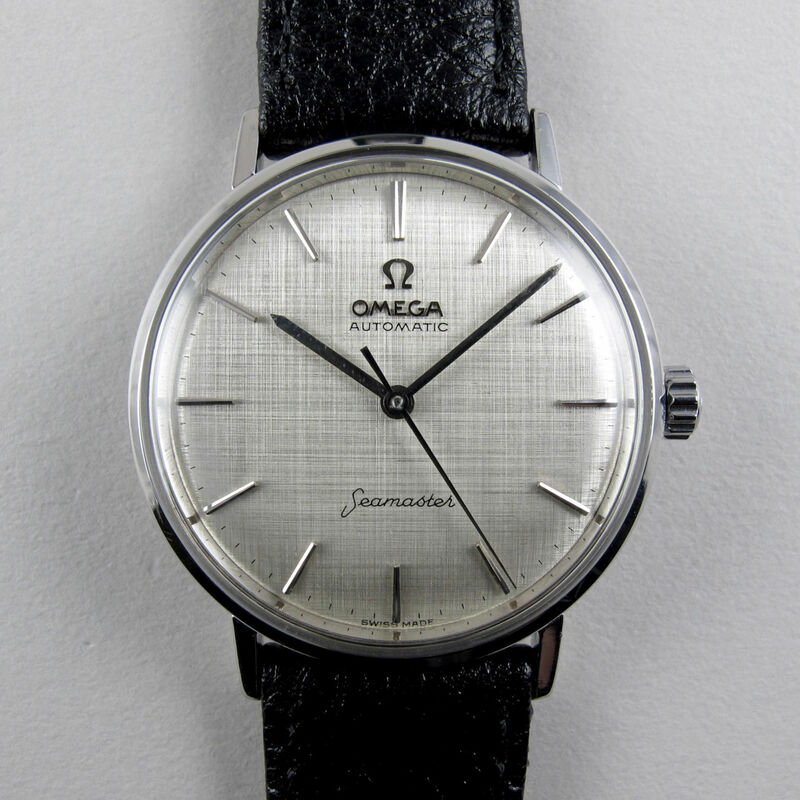 Omega first introduced their Seamaster Ref.14765 in 1960 . 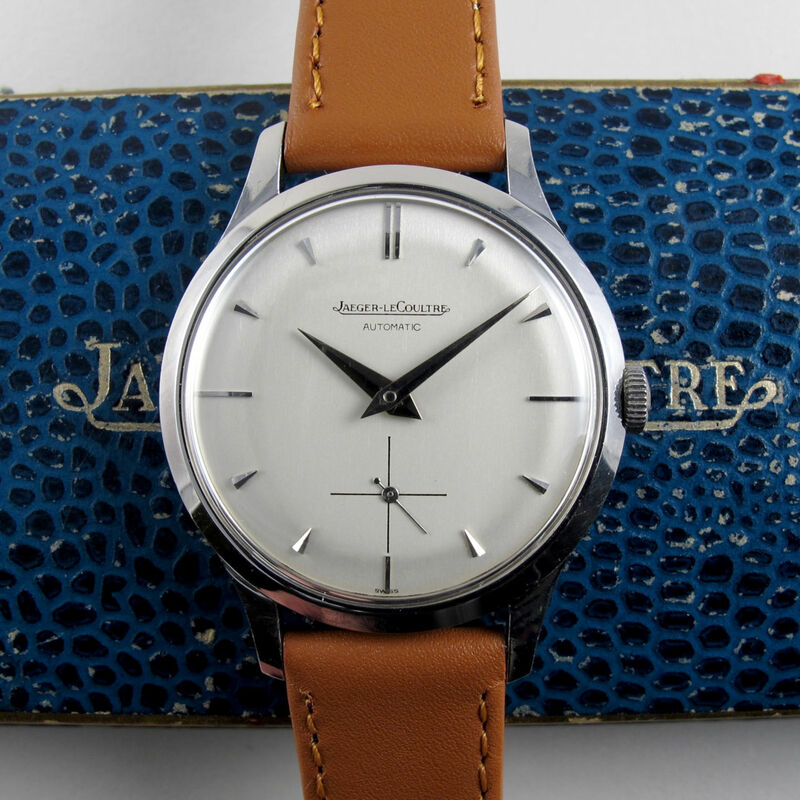 This example of the model has a bright, linen-textured dial which remains in excellent condition. The stainless steel case retains its signed Omega crown and crystal and the case back is centred with the Seamaster logo. The case has a uni-shell design which is composed of a solid single body, the movement being accessed by removal of the bezel, crystal and crown/stem. By limiting the number of case parts and negating the need for a removable case back, the risk of dirt and moisture entering the watch were greatly reduced. This lady’s Oyster model has a silvered satin finished dial with faceted hour indexes which are centrally set with black panels to increase visibility. The stainless steel Rolex Oyster case has a classic polished finish with chamfered bezel and screw-down case back. Automatically wound via the Tudor finished ETA 2650, the movement incorporates a hack feature – when the crown is unscrewed and pulled out to set the time, the second hand will stop, thereby allowing accurate synchronisation to a time signal. 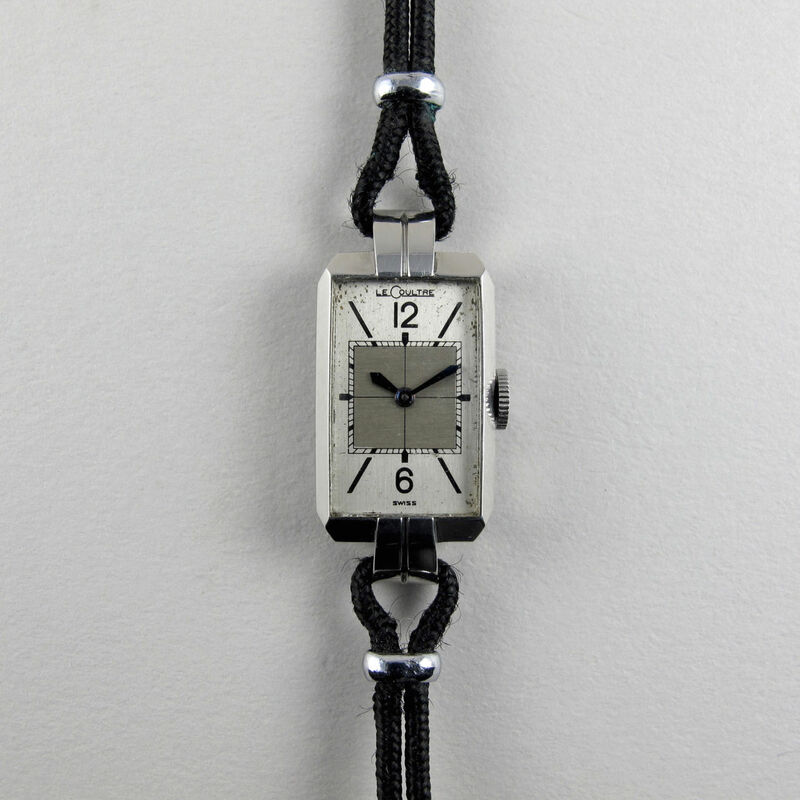 This smart vintage wristwatch was made by the German watchmaker Arctos and dates to circa 1950. The watch has a wonderfully rich black gloss dial, the contrasting numerals and outer minute track are formed from the silvered base of the dial. Cased in stainless steel, the watch has a gentle curve to the back and the lugs are rigid, solid bar lugs. 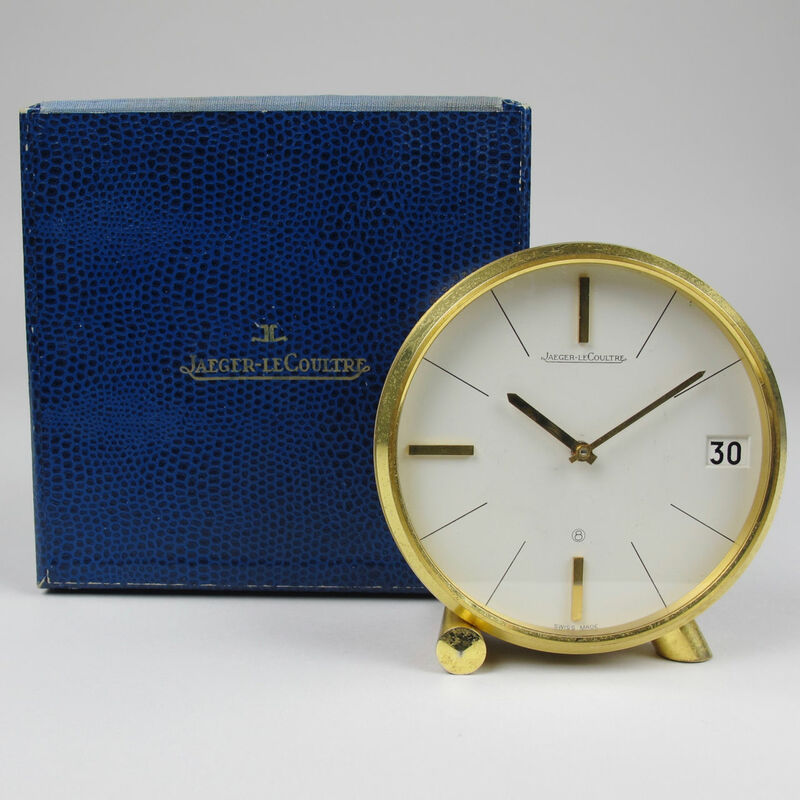 A stylish desk timepiece, this Jaeger-LeCoultre clock is accompanied by its original presentation box which has a fitted interior, especially made to accommodate this model. The clock’s feet are asymmetrically arranged, that to the left is cone shaped, whilst the right hand foot is cylindrical. The clear silvered dial has applied gilded batons at 12, 6 and 9 o’clock and there is an aperture for date at 3 o’clock. Powered by the calibre 228, this desk timepiece has a running reserve of 8 days meaning the clock only requires winding once per week. The date changes each day at midnight but a lever to the side of the movement at the back of the case allows manual adjustment when required. To automatically receive these updates via email please select the ‘Join our Mailing List’ tab at the bottom of any of our web pages.